Once you receive a disability, don't let the VA Medical Center reopen the case. After a 10 year ordeal, I was given a disability rating by the CW Bill Young Veterans Affairs Regional Office (VARO) about 10 months ago. The was after two Board of Veteran Appeals (BVA) hearings, four remands and a Decision Review Officer (DRO) Hearing. During the claims period I probably wrote more than 1000 pages of documentation, got 12 letters from board certified physicians and also filed several Disability Benefits Questionnaires. The BVA's Veteran Law Judge described my testimony as a highly credible. Even went through the Social Security disability process at the BVA's recommendation and prevailed there, too. Finally got the disability rating I deserved, Oh, what a relief it is! The lifestyle of my spouse and I greatly improved in the past 10 months. We have been able to do lot more for out three children. Have been helping one of my son's start a salt water aquarium business. Thought the disability ordeal was over, but found out on my last appointment at Bay Pines that it was not. The old head of the department had transferred to another location and I was given an appointment with a new specialist. The appointment was peculiar and conducted more like a compensation and pension (C&P) exam. Had to provide a lot of background information that was in my claim file (c-file) to the doctor. My wife has a great memory for dates so we were able to provide the doctor a history of my medical conditions including dates. The appointment broke down when the physician wanted an additional MRI scan, another diagnostic blood test and another procedure, all of which had already been completed. Had i agreed to the tests, it would probably have reopened the claim. Since my disabilities are permanent and total, I viewed additional testing as a fool's errand. Told the doctor he was trying to "reinvent the wheel." Said that wheel was already rolling. The appointment started to "go south" down at that point. The physician had an epiphany and realized his patient was not a fool and then asked me what my last occupation was. Told him IT and intelligence while i was in the Air Force. At this point we had been in the office nearly 1.5 hours and he wanted to move on to another patient. After the appointment, checked my medication list on MyHealthEVet. Two of my meds were gone, and one was life essential. It appeared the physicians was being vindictive and had canceled the medications. The next day I checked my medication history and found that the physician had actually deleted four of my medications. I called CW Bill Young Patient Advocates office the next day and reported the bizarre appointment and the deletion of my meds, one of which is life sustaining. I was refereed to the Assistant Direct of Medical something, by a woman named Danielle. She said she would file a report to the head of the department in question. The day after the appointment,I was able get the physician’s progress notes of the meeting. Found a lot of things in the progress notes that were peculiar. Called Danielle again and told her about the four meds that had been deleted and some of the concerns in the progress notes. Danielle said she would add this info to the report that going to the head of the department. Danielle seemed to irritated during the second call. Was getting ready to fire off a a complaint via the IRIS Inquiry system when the acting head of the clinic called. She was far more polished than the other physician and indicated doctors have their different styles and that my meds really weren’t deleted, the pharmacy just hadn't "released" the medications yet. One of my meds is refrigerated and my spouse returned a call to the pharmacy about the meds today. The pharmacy indicated that many of my meds, indeed. had been deleted. So I opted out of care from that CW Bill Young clinic today. 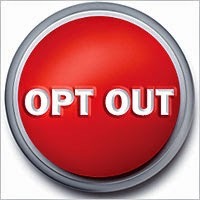 This is not an option that everyone has. Fortunately I have a alternative source for pharmacy meds so i don't need the annual clinic visit to recertify those particular meds. I still have a primary care doctor at the Palm Harbor Outpatient clinic so I can get most generic meds reauthorized there. If you are a vet, don't let a VA primary care physician, specialist or clinician talk you into tests that reinvent the wheel once you have been awarded a disability. This could result in you disability being downgraded or taken away altogether. Just politely say 'no." According the the CW Bill Young VARO senior counselor, it was unlikely that the VA would ever try to change my disability. My disability has been rated permanent and total. Have no interest in enabling a redo nor should you. Sometimes you just have to say, "No." 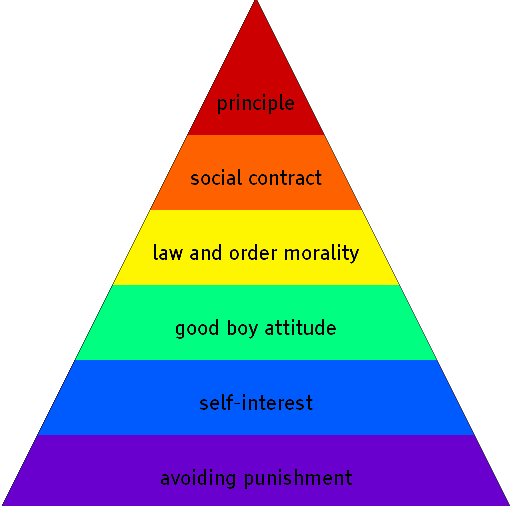 Lawrence Kohlberg's theory of Moral development has been used to explain the difference between liberals and conservatives on several occasions in this blog. In Charles Hampden-Turner's early work, Radical Man, he equated conventional thinking to conservatism and post-conventional thought to liberalism. The next two levels are conventional. This graphic that follows explains this in more detail. Conventionals also have two levels and the two levels explain why there is infighting among conservatives. The lower functioning Stage 3 conservatives, which are usually associated with groups, have the social relationship perspective of that peer-group. Most Christian conservatives, Rush Limbaugh ditto-heads, Tea Party and libertarians are Stage 3 conservatives. The Establishment Conservatives are the big picture Stage 4s who are more focused on law and order and defending the nation-state's values. Stage 3s and 4s are at odds with each other over the size of government and defence spending. For example, most libertarians are anarchist or minarchist and want the smallest possible government. These groups are also sceptical about defence spending and US military adventurism. Likewise, the militia are anti-government people who think their function is protect other conservatives from the government. The Stage 4s want to control the government. For example, GW Bush actually increased the size of government by creating the Department of Homeland Security and by increasing defence spending by 47 per cent. This is why Rush Limbaugh is suspicious of Establishment Republicans. The Stage 5 post-conventionals view government as a social contract that can be changed. The founders gave us a legislature to draft new laws that meet the circumstances of the day. 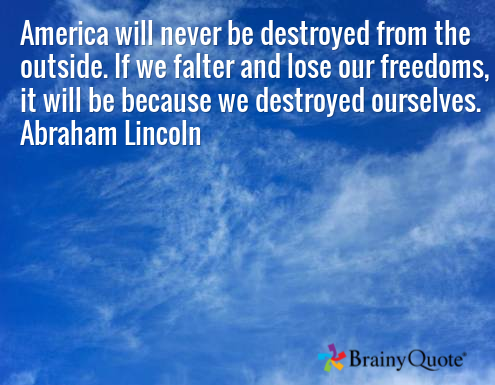 This is also why we have democratic traditions in the US that allow people to elect new legislators. A good way to contrast State 4 and Stage 5 was an article in which the conservative author stated the Second Amendment was in concrete. The Bill of Rights was an afterthought and it was not in the original US Constitution. The Bill of Rights is actually the first 10 amendments to the Constitution. Besides that the second amendment being poorly written and ambiguous, the Constitution has a rigorous amendment process that would allow this amendment to be rescinded. The Establishment Clause or the first amendment could also be rescinded. Nothing in the US legal system is really in concrete. Of course, many conservatives will argue otherwise and erect granite monuments of the 10 Commandments in front of court houses. Even monuments can be broken into pieces or removed. A man recently rammed a controversial 10 Commandments monument in Oklahoma with an automobile. The Devil made him do it. Conservatives want to limit options for women, minorities and the LGBT people. If a women marries an conservative, the husband may try to subordinate her to himself as the biblical head of household. A conservative state government may deny the women the right to an abortion and birth control. If a man is a gay, the state may deny him the right to marry another man. Minorities may have their right to vote suppressed by cutting back voting periods, locking bathrooms near polls, deleting voting locations in precincts and by sequestering minority voters into certain districts using gerrymanders. US Congressional Districts 13 and 15 are examples of this. In Florida, if you commit a felony, you lose your right to vote permanently. "In 2007 Florida moved to restore voting rights to convicted felons. In March 2011, however, Republican Governor Rick Scott reversed the 2007 reforms, making Florida the state with the most punitive law in terms of disenfranchising citizens with past felony convictions." 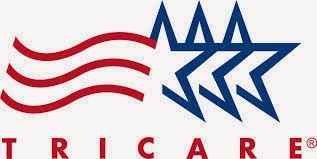 If you retire from the armed services, you and your dependents are eligible for Tricare medical . The two main flavors are Tricare Standard, that is equivalent to an Health Maintenance Organization (HMO), and Tricare Prime, that is equivalent to a Preferred Provider Option (PPO). Tricare is similar to Medicare, but it also provides prescription drug coverage. Once you reach age 65, you are eligible for Medicare. Medicare Part A covers hospital care and it is provided automatically. To maintain Tricare, you must accept Medicare part B which covers doctor visits. You are then given Tricare for Life as secondary insurance. Your spouse will continue to be covered by Tricare Prime until he or she reaches age 65. Then the spouse will be covered by Tricare for Life, too assuming Medicare Part B is accepted. With Medicare as primary insurance and Tricare is secondary, there is no need for Medicare Part C or D that provide prescription dug coverage. Tricare for Life covers prescription drugs. Notice that dependents must have a sponsor who is (100 per cent) totally and permanently disabled or the sponsor passed away from service-connected disability (less than 100 per cent.). If a vet never received a service connected disability, the survivors would not eligible for CHAMPVA. 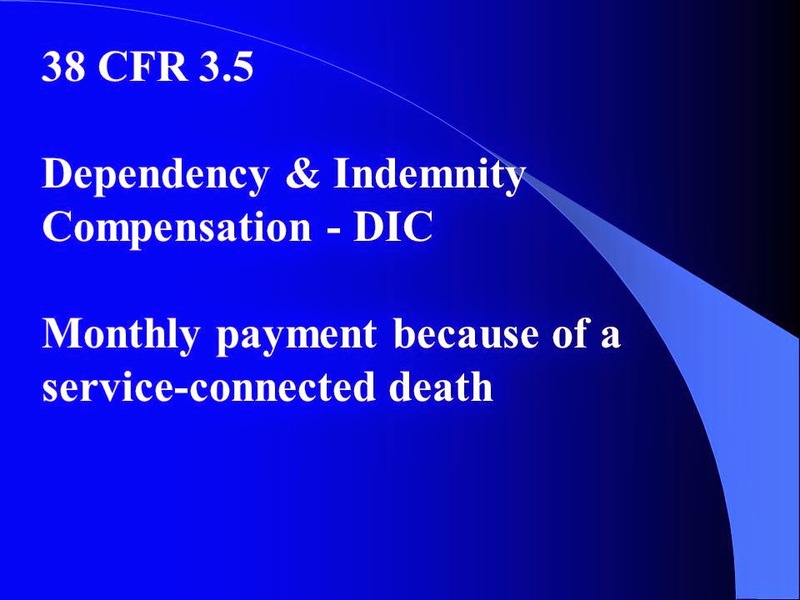 Of course, the death must be be related to the specific service-connected (SC) disability the VA has awarded. Likewise the spouse and children may be eligible for Dependent Indemnity Compensation. (DIC) when a disabled veteran passes. The criteria are similar to those for CHAMPVA eligibility. If a vet dies while a claim is being adjudicated, the survivors of a pending SC claim must open a new Accrued Claim. Why would a survivor want to reopen an Accrued Claim? If the death is related to the claimed condition, the survivors may be eligible for both CHAMPVA a medical coverage and DIC. Even if the claimed condition is not related to the cause of death, the survivors could receive disability compensation in the form of lump sum payment. 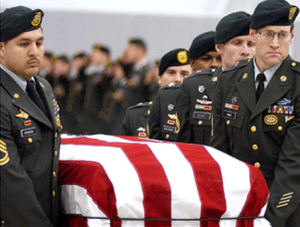 Accrued benefits are only payable if the VA Form 21-534 was filed within one year after the veteran's death. Once a dependent reached age 65, CHMAPVA becomes secondary insurance as is the case for Tricare. It is called CHAMPVA for Life. Thee are also Medicare part C & D. Medicare part D does provide prescription coverage, but this private program will become more expensive in the next 10 years. This is because the program was never properly funded by the Congress and it was being subsidized by Standard Medicare FICA payroll tax receipts. Obama removed the $10 billion subsidy form Part D and rolled the projected revenues into ACA. 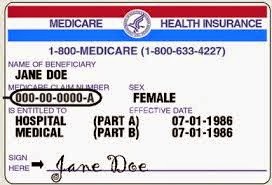 Medicare Part C that insurers also sell is similar to Part D.
Any vet who has either Tricare for Life or CHAMPVA as secondary insurance does not need Medicare Part C or D.
You an also purchase Medicare Supplemental or MediGap insurance to cover Medicare co-pays. This may be a better and lower cost option than Medicare Part C and D for people who need secondary insurance. Your local Social Security office should be able to answer any questions you have on Medicare or Medigap. As a retired armed services person or disabled vet, you may have some extra medical entitlements when you reach age 65.